Rabbi Joseph B. Soloveitchik, outstanding Rabbinic leader of the last century, served as an inspiring teacher for generations of students, as well as a venerated mentor for generations of leaders in the Jewish world. Reverently known as the “Rav”, with dazzling brilliance and profound wisdom, he revealed new layers of clarity and understanding in every realm of Jewish learning and experience which he addressed, ranging from halacha, Talmud, Tanach, Midrash, and Jewish philosophy to interpersonal and family relations, and communal concerns. the Rav came from a tradition infused with Torah scholarship, piety, intellectual depth, and dedication to mesorah, conveying the message of Torah from one generation to the next. The Rav embodied this tradition with nobility, and with his extraordinary talents was able to relate those traditions to the American scene in a unique manner. In my experiential—not intellectual—memory, two nights stand out as singular, as endowed with a unique and fascinating quality, exalted in their holiness and shining with a dazzling beauty: the night of the Seder and the night of Kol Nidrei. As a child I was fascinated, indeed entranced, by these two clear, moonlit nights, both wrapped in grandeur and majesty. I used to feel stimulated, aroused, inspired; illuminating vision heightened my senses, which were sharpened and liberated from all inhibitions. A strange silence, stillness, peace, quiet, and serenity enveloped me. I surrendered to a stream of inflowing joy and ecstasy. I can still hear the solemn, sad, nostalgic melody of “YaKNeHaZ”—the mnemonic acronym for the order of the sections of the Kiddush and Havdalah—which I heard most probably at the age of seven, when my grandfather recited the Kiddush on a Seder night that happened to coincide with the end of the Sabbath. I still remember the finale of the blessing, “ha-mavdil bein kodesh le-kodesh, Who distinguishes between holy and holy.” The melody gradually faded away—or, shall I say, was transposed into another melody, namely, one of silence. As a child, I used to brood for hours over the notion of “ha-mavdil bein kodesh le-kodesh”—two sanctities, one of the Sabbath and the other of the holiday. I liked both, I cherished every spark of holiness; I hated the everyday, the gray, the routine, the workaday dreariness. I always saw in my frail young mother, with her pale face, deeply set eyes, and aristocratic, gentle features, the personification of the Sabbath, of the Princess. I saw the holiday in all its glory represented by one of my uncles, an athlete, tall, dark and handsome. All these memories are at the root of my religious Weltanschauung and experience. Without them, I would miss the ecstasy accompanying religious observance and the depth and sweep of religious meditation and thinking. However naive and childish, these emotions and visions have always been, and still are, the wellspring of my colorful religious life. In this moving piece, written by the Rav himself, he reminisces about the Seder night, and the powerful emotional and spiritual impact it had on him as a child. He was entranced by “YaKNeHaZ,” the special Kiddush recited when the Seder night falls on motza’ei Shabbat, as it does this year. The work performed by the OU is a vital force in perpetuating the vision and goals of the Rav. OU Kosher applies the principles of the Torah as expounded by our sages, combined with the in-depth scientific expertise that is the hallmark of OU Kosher’s comprehensive approach to kashrut certification, to maximize the availability of reliably kosher food for the Jewish community. OU Press, the publishing division of the OU, is a major source for publishing and disseminating the writings and teachings of the Rav. The OU ensures that the Jewish People’s “rendezvous” with God on the first Pesach in Jewish history continues to reverberate in our own generation, and will continue to endure for future generations until our ultimate redemption. 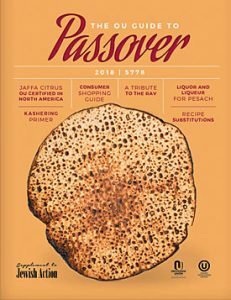 Download the OU Guide to Passover 2018 here.